I have posted a question on this a while ago. I see a fair number (just saw one today) of older patients (usually women) who have never smoked, have normal gas exchange and chest radiography but who present with moderately severe degrees of fixed obstructive lung disease. They never have any history of asthma, cough or wheezing and their only complaint is DOE. 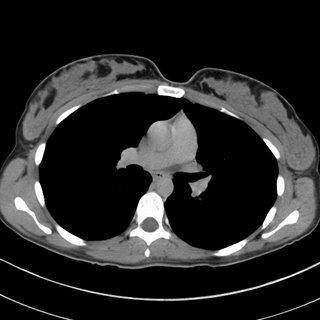 Usually there is some small-airway obstruction on the expiratory images of a HRCT but no other structural abnormalities. Have you seen much of that? How do you label these patients? Unsuspected asthma with remodelling? 62 woman c/o 2 weeks ago started to have cough with greenish sputum. She presented to the ER where workup included a CT (below). 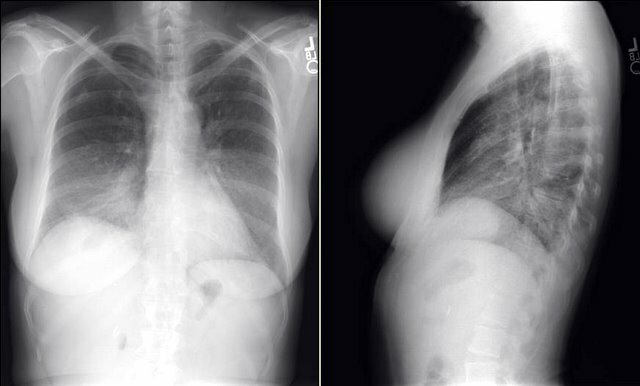 Pt states that was diagnosed with asthma in 2002; at that time she had a CXR that showed scar tissue in the left upper lobe secondary to a previous pneumonia. She noticed that over the last year, she has being unable to lay down over her right side because she would feel short of breath, so that she always sleep over her left side. Denies frequent cough, sputum production, hemoptysis, weight loss, loss of appetite, chronic chest pain. pt has 40 pack year history of smoking, quit in 1998. She works as hair stylist and is exposed to fumes and chemicals. Denies exposure to TB. No recent travels. BP 139/83, HR 86x', RR 16x', O2Sat 93% on RA, W 212 pounds. Patient is awake, alert, obese, oriented x3, no acute distress. Neck, no lymphadenomegaly. Chest, no use of accesory muscles, no retractions, flat to percussion on the left, no prolonged expiration, absent breath sounds in the left, no wheezes, no crackles. CV: regular rhythm, no S3 or S4, no murmurs. No rubs. (quick) DDx and how would you proceed? 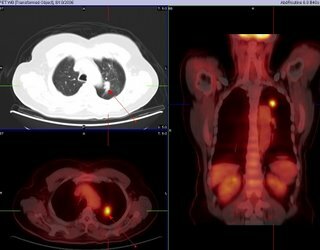 How frequently and for how long, do you follow xray/CT's after the surgical resection of a stage 2 lung cancer. A patient had a previous negative PPD as a requirement for work. She then went oversees for a time and receieved the BCG vaccine. She is now back in this country and as part of work requirements gets another PPD which is now positive. 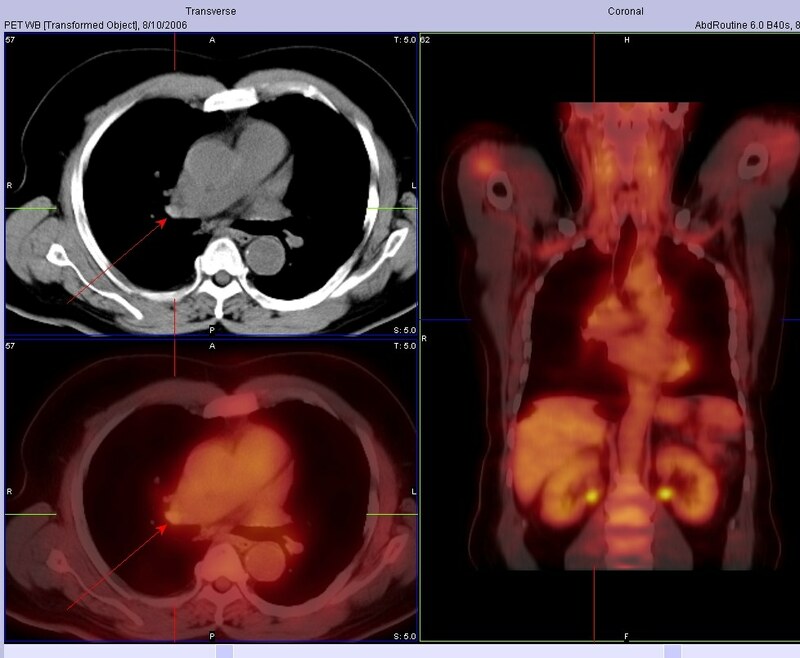 She is asymptomatic and the chest xray is negative. 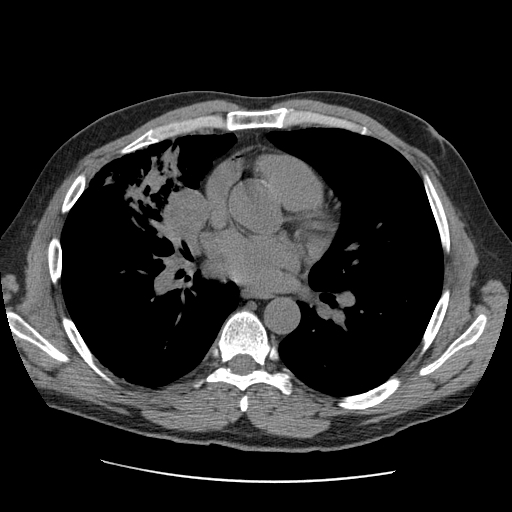 I have just seen this 47 y/o woman for new onset dyspnea. She has had malaise, non-productive cough and DOE for the past 6 weeks. Occasional "low-grade" temps but no fevers. No TOB Hx. She works at a auto air-bag manufacturer and part-time at a Wal-Mart. No other exposures. Exam is pretty unremarkable. PFTs revealed a mild restrictive deffect with low DLCo. Any suggestions? (BTW, ignore the small apical PTx, that was from vigorous bronching). I just saw this 70 y/o woman in consult today. Her only complaint is dyspnea on exertion: she gets tired after walking more than a mile. No TOB, no Hx of lung Dz. She had 3-4 episodes of pneumonia within 2 years > 5years ago. No chronic cough. Physical exam is unremarkable. PFTs showed a moderate mixed defect. 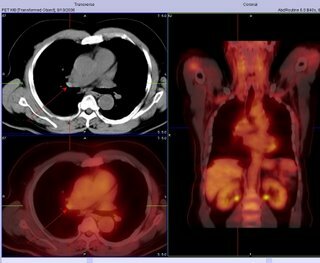 She has the bronchiectatic/focal cystic changes above and the rest of the CT was normal. How would you work up her focal bronchiectasis and do think those small areas are sufficient explanation to her dyspnea. Ok, hopefully you can help me with this case. It's fairly long and complicated - not easy in this blog format but that's what we're stuck with. I presented this case before, but that was before some additional data. A biopsy was done. It showed interstitial inflammation. A previous biopsy had been obtained with similar non-specific findings. That one was read as "a mixed inflammatory infiltrate, greatest in the bronchial submucosa, with increased numbers of eosinophils. There are intraalveolar pigment/ hemosiderin laden macrophages and fresh blood; there is no vasculitis in this limited sample. Grocott stain is negative for fungus." pancreas, nonspecific. This was biopsied by CT-guided and showed "The biopsy has stromal fibrosis, attenuation of the ducts/ acinar component and accentuation of the islets. 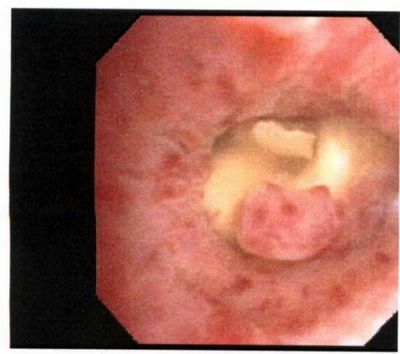 In one level, there is a single granuloma My underline and the possibility of an underlying granulomatous inflammatory disease, such as a fungal infection or tuberculosis, accounting for both the lung and pancreatic lesions, cannot be excluded. Grocott stain is negative for fungus. Ziehl-Neelsen stain is negative for acid-fast bacteria. Immunostain is negative for mycobacteria. The present biopsy is not representative of a mass lesion." He also was found to have adrenal insufficiency (cort-stim test) picked up when he presented to my clinic with hypotension, hyponatremia and hyperkalemia. (ACTH was 356). He also had a calcium of 10.9 but with normal PTH level (23). Bronchial washings were negative for fungal. There was no growth of any micro subsequently. A p-ANCA and c-ANCA were negative. Any ideas on what's going on with this patient? 25 yo female with no PMH presents with above. She was well until April when she travelled to Phoenix to visit friends. When she returned, she had a bad URI. 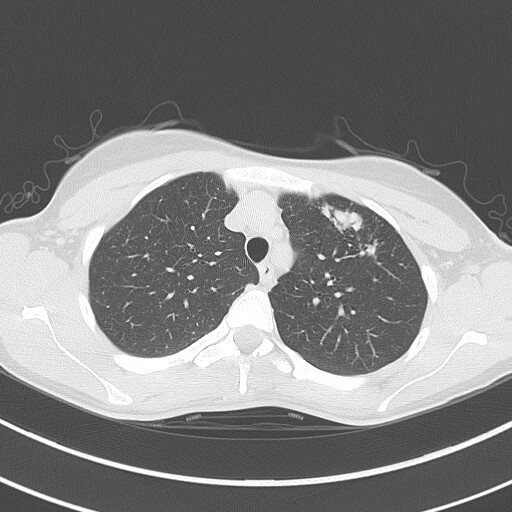 Her PCP obtained a CXR which showed a shadow in the L hilum, and a CT was recommended. 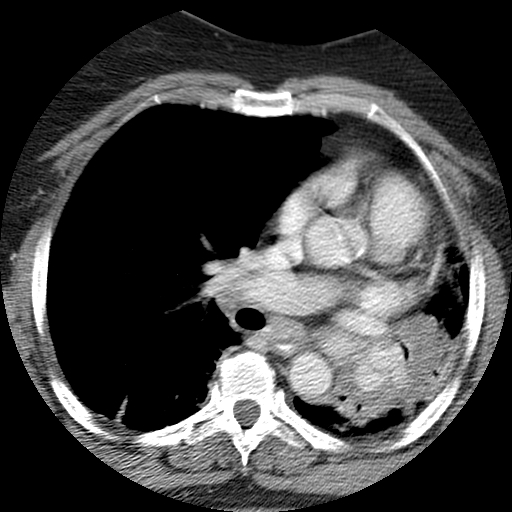 The CT was from an OSH and resembles the CT shown below. The L hilar fullness is a node clearly visualized in the OSH CT; the CT I show is without contrast (she got hives after the first CT). The rec on the CT was to obtain a repeat in 3 months. This is the 3 month CT.
She is currently asymptomatic other than a 20 lb weight loss since 4/06. She has not changed her eating habits or exercising habits. PMH: Non-smoker but moderate second-hand smoke from her parents. Labs: CBC, chemistries, U/a are all normal. A 40 year old affrican american man presented with a 40 lb weight loss and a slight cough. His spirometry was normal. A CXR showed symmetrical bilateral hilar adenopathy and a transbronchial biopsy of the upper lung showed noncaseating granulomas, consistent with sarcoid. He has no complaints of shortness of breath. Would you treat with steroids? Is there any caveats or different management decisions regarding sarcoid, when the only presenting abnormality is weight loss (SOB absent with normal PFTs). What is your usual practice regarding inhaled steroids when you admit a patient for either status asthmaticus or AECB? If they are already on an ICS on admission and they will be on a systemic steroid do you continue the ICS? Conversely, if they are not on an ICS on admission and are now on a systemic steroid, do you start an ICS during the admission or after D/C? Because of this, he underwent LUL lobectomy. However, an ipsilateral mediastinal node was positive. I do not think they sampled the area of the hilum that lit up (it was contralateral), so in this case the PET did not indicate that he had spread. Also of interest, the margins from resected mass were negative. My partner bronch'ed this pleasant 78 y/o woman with no TOB Hx who had developed a persistent RML collapse. The first picture was taken while instilling NSS to keep the airway open. The lesion was hard to biopsy and there was purulent mucus behind it. The second set of pictures was a re-bronch 2-3 days later after he tried to remove as much as possible with the forceps. This is my VIP patient who got to see us and Hem-Onc at the same time and had a Squam on a CT-guided Bx. She then had a PET scan which lit up on the mass and on a small (<1 cm) ipsilateral hilar lymph node. She underwent a med which showed only reactive adenopathy. She had a lobectomy 2 days ago with a T2 squam with negative margins and negative nodes. At your institution, would you offer adjuvant chemo, xRt, both or neither at this point?